Over the past few years we’ve grown accustomed to using our voice to interact with Siri-enabled iOS devices. So why not expect a similar experience with our computers? While not the hoped-for “Siri for the Mac,” use of the new Dictation Commands feature in Yosemite can deliver a powerful and personalized interactive experience in OS X. Speech Recognition has been an element of the Mac experience since the pre-OS X days and lives on in the current Mac OS. While the Speakable Items interface has provided the means to control such standard computer interactions as switching applications and launching websites, it’s remained separated from the Dictation abilities in Mavericks. In Yosemite, Speakable Items are gone. Their functionality has been merged with the Dictation architecture of the OS and morphed into a new feature called Dictation Commands. 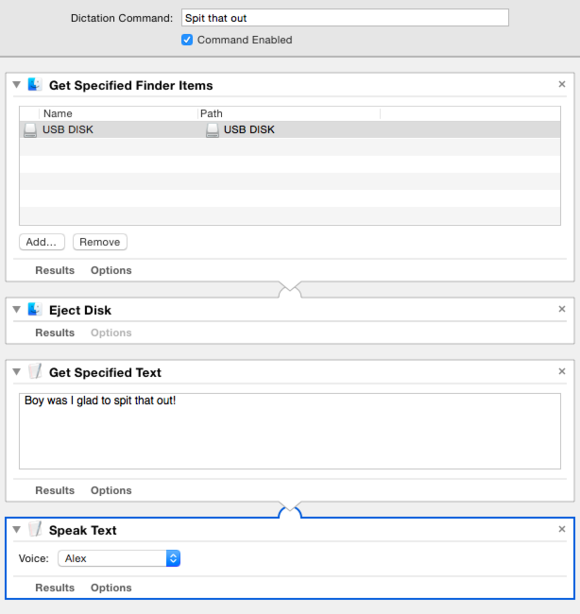 But unlike Speakable Items, Dictation Commands are not separate from the rest of the speech architecture. Turn on Dictation and you automatically gain access to Dictation Commands. At any time—even during a dictation session—you can speak the title of a command to have it recognized and executed. Also gone is Mavericks’ round floating Speech Feedback palette, replaced instead by Yosemite’s simple Dictation Response HUD. 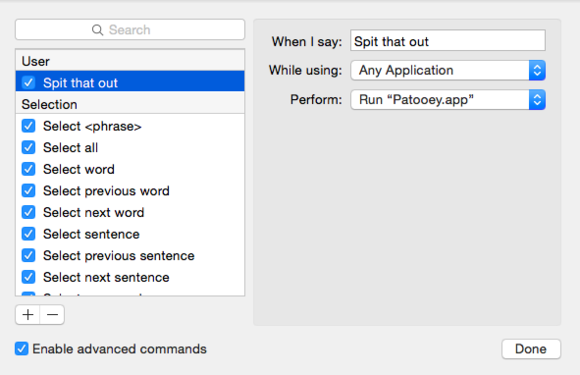 The best part of the new speech-related abilities of Yosemite is how easy Apple has made it to extend and customize Dictation Commands, courtesy of a new Automator template. When you launch the Automator application in Yosemite, the workflow template chooser offers a new option: Dictation Command. Using this new workflow template you can create a system Dictation Command that automates any process or task that Automator is capable of performing. Let’s give it a try by constructing a workflow that ejects your favorite USB thumb drive. To begin, launch System Preferences, select the Dictation & Speech preference, switch on Dictation, and then enable the Use Enhanced Dictation option. Do this and your Mac will download an approximately 800MB file, which allows it to use Dictation without having to connect to Apple’s servers. Begin by enabling advanced commands in the Dictation accessibility preference. While still using System Preferences choose View > Accessibility. Select the Dictation entry at the very bottom of the list and click Dictation Commands to the right. In the resulting sheet click the box next to Enable advanced commands and click Done. Now launch Automator, select Dictation Command from the workflow chooser (see image at top), click Choose, and construct this simple workflow. 1. Plug in your USB thumb drive. From the Files & Folders library drag Get Specified Finder Items into the workflow area. Drag the mounted USB drive into this action to add it. 2. From this same Files & Folder library drag in the Eject Disk action. 4. Drag in the Speak Text action from the Text library and choose the voice you’d like to use (Alex is the default). 5. At the top of the workflow enter the command you’ll speak to trigger the workflow. 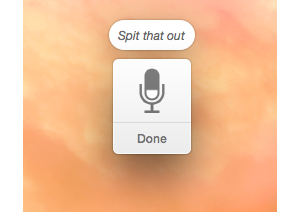 I like “Spit that out.” Then click on the Command Enabled checkbox. Save and name your workflow and quit Automator. The Dictation Response HUD will respond to your command. To use the workflow, just press the key command that initiates dictation (pressing the Fn key twice is the default). The Dictation Response HUD will appear. Speak your command and, after a second or two, you’ll see that command written out above the HUD and the workflow will be triggered. Your USB thumb drive will unmount and to confirm it, Alex will tell you of his relief. And that’s it, a simple job performed with a simple spoken command. And it doesn’t stop here. Within Accessibility’s Dictation component you can also trigger AppleScripts with a voice command, making your Mac all that much more powerful. If you’d like more information about this and other Automator workflows, visit macosxautomation.com. Updated: Added information about switching on Enhanced Dictation and the ability to trigger AppleScripts with voice commands.